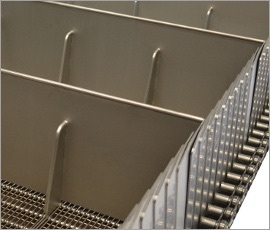 Do you require a special conveyor belt for your production process? Many of our clients ask our innovative engineering team to come up with revolutionary special conveyor belt configurations for their production processes. Our team often comes up with innovations that are completely new to the industry. Click on a case-study below to learn how we helped our customers by creating effective and efficient special conveyor belts. 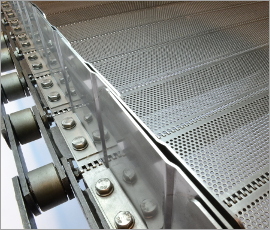 Plate conveyor belts are well suited to drying processes. The self-supporting structure of these belts means they can be used over large widths without support. 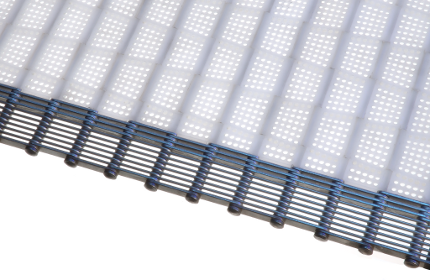 Perforations allow the opening in the belt to vary from zero to very large. 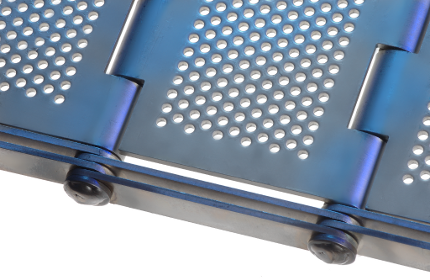 Chain-driven plate belts can be fitted with edge plates. 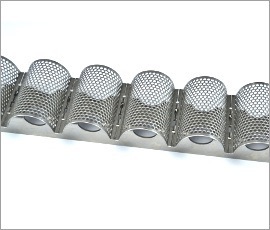 The specific structure of metal conveyor belts makes these suitable for use as filter plates, with an opening that is precisely aligned with the product to be filtered. Depending on the filtration process, spiral wirelink or eyelink belts can be used, or even combinations of both belts. We are happy to assist you with configuring a special conveyor belt for your production process. Do you want to learn more about a project or do you have a different demanding process and application that requires a unique and custom solution? Our engineers are ready to answer your questions and collaborate with you to create an optimal solution!